The Hollywood Rescue Grooming Foundation is changing the lives of pets and making a difference. On a bi-monthly basis, the professionals from Go Hollywood Grooming volunteer their time by helping out at a local animal shelter. They groom as many dogs as possible, helping each and every dog get a better chance at finding a forever, loving home. After Go Hollywood has done their magic, about 89% of those pets end up getting adopted. In addition to providing grooming services to these homeless animals, Go Hollywood Grooming also donates to a foreign orphanage. 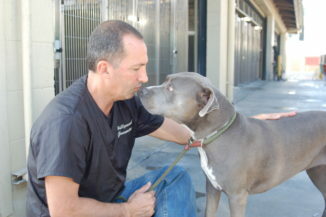 Go Hollywood Rescue Grooming Foundation operates through an abundance of community support. We have partnerships with the local animal rescue teams that allow us to help out in the community as well. We participate in community events, animal advocacy and educational programs both locally and nationally. So, paw it forward by volunteering your help at one of our events. Our volunteers are amazing people that truly love and care about these animals. Help us educate the world about the importance of assisting animals today. If your schedule does not permit time to volunteer, a kind donation to help our furry friends is always appreciated. Start making a difference in a homeless animal’s life today. Please note that all donations are TAX DEDUCTIBLE! Donations will go directly to our animal shelter grooming program. Each time Go Hollywood Grooming makes a visit to a shelter, about $2,000 of their own money is spent in gas, groomers, supplies and marketing, so your donations truly help a lot.